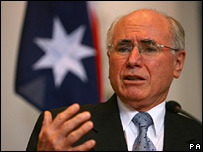 Australia's Prime Minister John Howard has announced a study into whether the country should develop nuclear power. Experts will assess whether Australia should shift some of its energy production from coal and gas to nuclear energy, which it has so far shunned. The panel will present a report to the government by the end of the year, Mr Howard said. The move is likely to spark opposition in Australia from both the environment and coal lobbies. "Cabinet has approved the establishment of a prime ministerial task force to review uranium mining, processing and nuclear energy in Australia," Mr Howard told journalists. The inquiry would address whether it was "economically feasible to contemplate the establishment of nuclear power stations in this country", he said. Mr Howard said the private sector would be responsible for building power stations, not the government. Former Telstra head Ziggy Switkowski has been appointed to head the inquiry. The move is likely to lead to considerable debate in Australia, both over environmental issues and the cost of developing a nuclear power industry. At the moment, the majority of Australia's energy comes from coal and Australia is also the world's largest coal exporter. Critics argue that Australia does not need nuclear power because of its huge coal resources. Environmentalists have also been consistently opposed to any domestic nuclear power industry. But the Meteorology Bureau's announcement in January that 2005 had been Australia's hottest year on record prompted renewed fears of global warming. Australia is one of only two major industrialised nations not to have signed the Kyoto agreement on reducing greenhouse gas emissions, the other being the US. Nonetheless, Australia faces international pressure to reduce emissions, and nuclear power could be one way to do it. 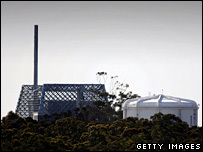 Australia currently has one small research reactor, located at Lucas Heights in Sydney. It also holds 40% of the world's known uranium reserves and recently signed an export deal with China. "It is foolish to see ourselves as simply an exporter of uranium," Mr Howard said. He told Australian radio that he believed attitudes to nuclear power were changing. "I am not persuaded as yet, although in my bones I think there has been a fundamental change," he said. "But I want to see the evidence."